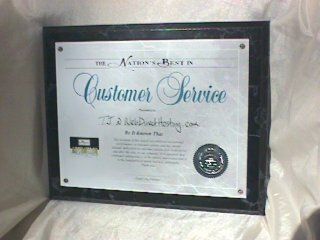 I wanted to commend WebDirectHosting.com on the superior hosting service and products that you are providing www.vandygold.com. All my questions have been answered promptly and in detail. I could not have chosen a better home on the Internet for www.vandygold.com than www.webdirecthosting.com. After doing countless hours of research into web hosting companies, I am thrilled with my selection of Webdirecthosting.com. I would urge anyone looking into a web site to subscribe to your service because of the remarkable pricing and service. The recipient of this award has exhibited exceptional performance in customer service and has shown unusual dedication to customer satisfaction, both before and after the sale, to our company. It is apparent that the continued satisfaction is of the utmost importance and it is the foundation of future business philosophy. Great Job. I am writing to praise your web hosting service. I have had to deal with several and overall I believe you have beat them all. I was impressed by the speed of the setup as well as the speed of your file manager as well as the whole package. providers but never got. Don't let the low price fool you. Timothy is a live person, not an auto responder! To him you are more than a dot com or an email address. He demands more from himself than anyone could ever possibly expect. WebDirect doesn't end with registration, it merely begins. What follows is the most incredible customer service and support you will ever experience. It won't take long to realize what so many others have. You too will be singing their praises to anyone who will listen. WebDirect is customer service. You will not be abandoned. Your satisfaction is their only concern. It doesn't matter if you're a large corporation or just starting you out. You are an equal priority. WebDirect has been there when I needed help most. When they don't hear from me, they write to see how they can help. I have never been more pleased. That's all they want for you too! Thank you very much for your detailed instructions and image help. They have been very useful for me. I never expected such great technical support and I am truly grateful for your assistance. wisdom. It can't be easy for you having to teach me this stuff. such a big help, I can't thank you enough. I wanted to commend your company on the excellent service and customer support that it has provided to me. Even before I became a customer, your staff was more than willing to offer objective opinions and assistance to my web hosting concerns. Since I have become a customer, I have continued to be very pleased with the excellent service that has been given by your company. I am also very fond of the Service Manual offered on your home page. It answers nearly every question one could have about administering their domain. Keep up the good work, and thanks again for the great service. I just wanted you to know how very much I appreciate all the help you have given me. If webdirecthosting.com is willing to do so much for a very small, inexpensive account, especially when the problem does NOT lie on your end, I know you must be totally committed to customer service. Rest assured that I will be screaming your praises to anyone who is listening and highly recommending your services to anyone looking to find a hosting company. I will definitely use you guys from now on for any new accounts I will be setting up. Just a quick note to say how much I really appreciate your prompt and thorough response to my emails. I am in awe of how quickly you responded, not with technical jargon, but with results. The construction of my site is now moving forward faster than I had even anticipated thanks to your help. I honestly have not had a better experience with any other company online! I have used your hosting services for several months now, and every time I have a question or a problem, you answer my request in record time! If you take a look at my home page, you will see that I have placed a banner for WebDirectHosting.com. I am going to remove a website company for which I am currently an affiliate and had placed a banner. I will not recommend any other web hosting company to my members or my clients! I would like to place your banner at the top of my page, but I need a smaller graphic. If you have one, please let me know. I would like to add the link ASAP! So, thanks for your help, I look forward to growing with WebDirectHosting.com! "I appreciate your service throughout the last year & 1/2, you've been awesome to do business with! You are a gentleman in every sense of the word, you are very pleasant to work with & extremely helpful, I do appreciate that!" Thank you so much, You've been great!! Re: Thanks for terrific customer service!! Hello I hope that your Sunday was quite enjoyable and quiet. Thank you so very kindly for coming to my rescue. It is deeply appreciated. I recently had a problem with a site that I have hosted through your company and support contacted me through AOL Instant Messenger. They helped me figure out the problem for hours even though we came to find out that it may not have had anything to do with the hosting. I just wanted to contact you to say that they helped me above and beyond the call of duty and I was very impressed. I own a web design company and plan to refer all my clients to you as a result. Our 30-Day 100% Money Back Satisfaction Guarantee. Your satisfaction is our priority. Try our web hosting service for 30 days. If at anytime during the first 30 days you are not completely satisfied with our service, we'll refund 100% of your hosting fee. No hassles. No questions asked! can move quickly to help or answer any questions.